SINGAPORE: A Regional Comprehensive Economic Partnership (RCEP) — a “free” trade agreement between the 10 Asean (Association of Southeast Asian Nations) and its major trading partners in the region — is expected to be signed later this year. But labor unions and workers’ rights advocates in the region fear that the secretive six-year negotiations will further erode workers’ rights in the Asian region, while strengthening the hands of investors who may even be able to sue governments for changing laws such as setting minimum wages, that would erode their profitability. Singapore and Japan — the poster boys for the failed Trans Pacific Partnership (TPP) that included similar provisions and negotiated in secrecy — are pushing for the adopting of RCEP by the end of the year. “At this point in time, we have reached a stage where we are very near, and we can see the possibility of having a substantive conclusion for the RCEP negotiations by the end of this year,” Singapore’s Trade and Industry Minister Chan Chun Sing, told the Straits Times after the latest round of negotiations in Tokyo in July. 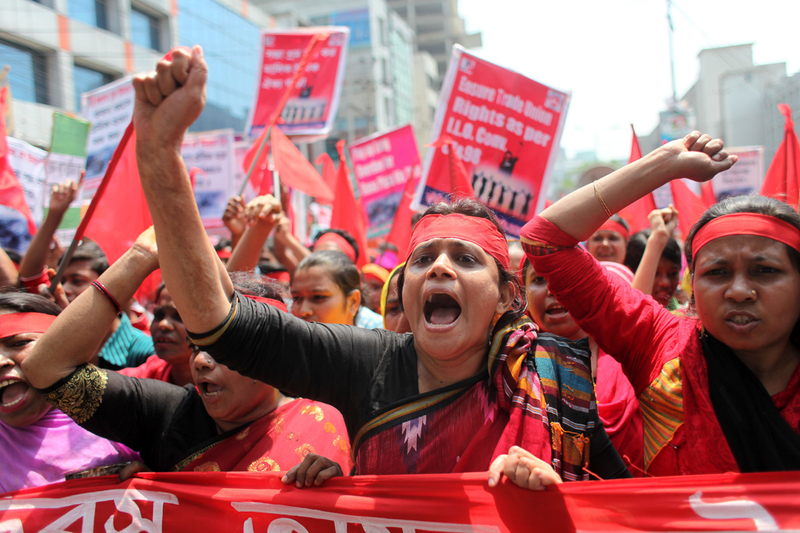 This push for so-called “free trade” that is supposed to bring further prosperity to the Asian region, is coming at a time when labor rights activists are being harassed by companies, arrested by police when they mount protest actions and have their houses are attacked at night by unidentified parties where police have refused to come to their aid. Australia, Brunei, Cambodia, China, India, Indonesia, Laos, Malaysia, Myanmar, New Zealand, the Philippines, South Korea, Japan, Thailand, and Vietnam are the countries that have been negotiating the RCEP behind closed doors. RCEP comprises 18 chapters, of which just two have been concluded after six years of negotiations. In late July, more than 80 civil society groups, unions, indigenous organisations and academics from these countries gathered in Bangkok to protest against the secrecy under which the RCEP was being negotiated. They pointed out that the RCEP has provisions for foreign corporations to sue governments for passing laws or pursuing policies which reduce their profits, and seeks stronger intellectual property rights for big pharma and the agrochemical industry, while also pushing governments to privatize essential services and seeking to prohibit the regulation of these service providers. “These provisions are likely to have an adverse impact on half the world’s population’s access to medicines, food, healthcare, control over national resources and labor rights,” noted Pavan Kulkarni, of India’s News Click news portal. “While parliamentarians and civil society have been left with little say, large businesses have been provided with disproportionate access. They have not only received information about what is being negotiated, but have been in a position to set the agenda for the negotiations itself. As a result, the agreement, in its current form, contains a number of provisions which would bring enormous benefits to big businesses at the cost of the people of the countries whose governments are signing the RCEP,” noted Kulkarni. “One such provision is the investor-state dispute settlement (ISDS), which allows foreign companies to sue the governments in arbitration courts abroad for passing laws and regulations that might reduce the profits expected by them during investment,” he said. While the governments, it seems, are negotiating away their (and their people’s) rights to regulate for the greater welfare of the population, in favor of corporate profit maximization, a rising tide of labor unrest across the region over minimum wage and tighter contractual legislation to protect workers’ rights, is being repressed by these same governments. Radio Free Asia (RFA) reported on July 30 that authorities in the southern Chinese province of Guangdong were holding more than 20 workers at a technology factory after they tried to set up their own trade union with the help of Maoist activists. Police claimed that they were being held on suspicion of “picking quarrels and stirring up trouble,” and that they were later released after undergoing a “legal education” session. According to the open letter delivered by protest leader Shen Menhyu and fellow activists, Jia Lei, owner of the Jasic factory and personnel manager Guo Liqun were both delegates to the Shenzhen People’s Congress, a rubber-stamp body entirely controlled by the ruling Chinese Communist Party. Guo’s husband is also a high-ranking official in the local government. The workers were detained on July 27 as they protested the dismissal by factory management of those involved in a bid to set up a union through legal channels. In a statement issued via the company website, Jasic claimed that there was “malicious” information spread through Weibo and WeChat (Chinese social media forums) about their company and staff, with exaggerated headlines and fabricated statements. The company claimed that they treat the workers well and those arrested “created squabbles with physical violence” at the workplace. Similarly, in the Philippines, some 300 workers at the NutriAsia factory near Manila were violently dispersed by the company’s security guards and the police, after an ecumenical mass was held outside the factory gates. According to the College Editors Guild of the Philippines, 19 were arrested. They were protesting over the management’s refusal to implement a Department of Labor and Employment (DoLE) order for the regularization of contractual workers. On July 3, DoLE ordered the sauces-and-condiments distributor NutriAsia Inc. to regularize 80 workers, as the company continues to reel under accusations of unfair labor treatment. Among President Rodrigo Duterte’s 2016 campaign promises was to stop the abusive practice of hiring employees on short-term contracts. Last May, he signed a much-awaited executive order prohibiting “illegal contractualization,” known in the Philippines as “endo” (end of contract). But, the President has since asked Congress to change labor laws to make this implementable, which unions and labor activists claim is a cop-out by the president to make real change to workers’ rights in the Philippines. In Vietnam, according to RFA reports, unidentified assailants have stepped up their late-night assaults on a former political prisoner and her father at their home in Vietnam’s coastal Lam Dong province, cutting the power to their house in July before attacking it with noxious gas and a barrage of rocks. Speaking by phone with RFA, Do Thi Minh Hanh, who was released in June 2014 after serving four years of a seven-year sentence for distributing leaflets to workers at a footwear factory, said that when her home was attacked at about 11:30 p.m. on July 3, police refused to come and investigate the assault. While governments tend to pay scant attention to workers’ needs and their demands, the Asean Parliamentarians for Human Rights has called for transparency in their governments’ negotiations for a RCEP.